Roberto – Congratulations! 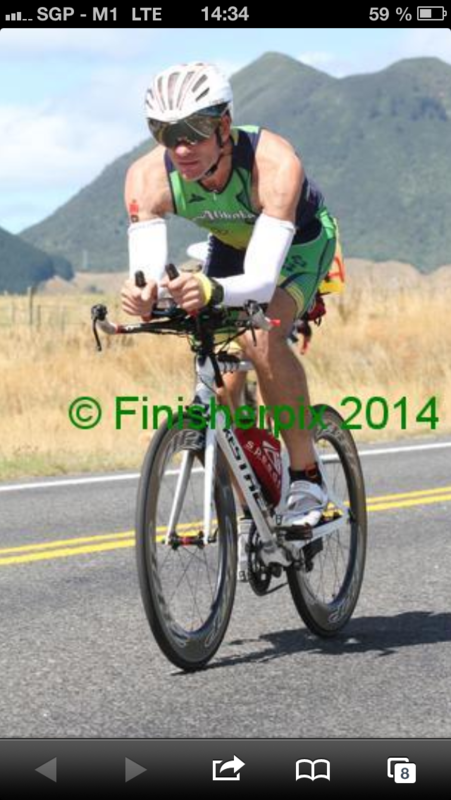 It’s a rare occurrence that an athlete finishes their maiden Ironman so close to 11 hours. I’d like to get into your head a little and draw out inspiration for the rest of us age- groupers out here. Strangely enough, I had my strongest emotions at the start of my second loop (out of three) on the run. b) Even though I had a goal to finish my 1st ironman in 12 hours I didn’t know if I was going to be able to achieve it. The swim part went well time-wise and I had gained a few minutes on my time table, but the strong wind, the rough tarmac and the hills took their toll on my bike leg: 5:41. So I went into the run with a lot of respect and just replayed the same mantra. in my head: “smooth and easy”. My coach had also told me to “Treat it like a long jog”. This piece of advice proved to be the real key for my run. When I started the second loop with 28km to go, I checked my watch and realized that not only would I make it within 12 hours but rather in a low 11h if not better. Somehow, knowing that everything depended on my run skills, whether I could keep this speed, whether I hit that famous wall on the marathon, and the fact that I really really wanted to make it, brought me so close to an outburst and cry. Don’t ask me why! In my mind all the run-related exercises and sweat went through like a movie and I told myself that nothing would stop me now to reach those low 11 hours. Guess I am an emotional person..! On the last 3km I even found the strength to finish strong with a long sprint as I knew I had made it and by the time I crossed that line my emotions were already under control. Pity, actually…I even stopped a few steps before the ramp, took off my hat, “combed” my hair, zipped up my suit and bowed: we sure want to look good on the finisher pictures! The walk from home to the race location was freezing cold. I felt excited and a bit anxious: I had never started a swim with so many people around me. And although I am a very confident swimmer, I had the worst of the starts one can imagine. After 40-50m into the swim I simply felt I couldn’t breath. That “anxiety” was so strong that I stopped swimming with one hand and started to pull at my wet suit around my chest. This obviously made it worse as people behind me simply swam over me which made me swallow a lot of water. I was indeed SOOO close to withdraw from the race. And I presume I would have if not for the fact that if I had indeed stopped, I would have been overrun by at least 1’000 people behind me. So I gathered myself and swam to the side of the bunch and that’s when it started to go well again. I guess that was my first panic-attack in my whole life and I still need to analyse it. I followed my coach’s advice and kept drafting behind swimmers. As I found my confidence and rhythm in the open water, I found it quite fun to keep changing up to a quicker draft. In the end, it worked well and I arrived 15min ahead of schedule. This was a huge boost. Based on my coach’s strategy to stay patient and conservative on the first 2/3’s of the bike I kept the whole first full loop “easy” and let people overtake me. The plan was to see how much I could push in the last 1.3 of the bike. I started the second and last loop more aggressive. I knew that was when I had to attack as the wind was in favour and kept pushing it all the way through to the turnaround at km135. The last 45km, uphill and against the wind, were simply torture. With 25km to go, I knew that I wouldn’t manage to stay within schedule. This frustrated me and as a reaction I started to push harder. Man, that hurt!!! I think that was the most fun part of the whole race: I started to run as fast as I possibly could at that moment and I think I overtook about 50 people on my last 2km of the race. Awesome! The last 2 months of the training depicted very well the mental conditions of the race. Although I had never rode 180km (160km was my max), and despite the fact that 180km ARE veeeery long, those long and lonely bike rides prepared me perfectly for race conditions. Moreover, all the tough sessions I had leading to the race during the past 6 months helped me being confident that I can make it. If I had survived running up that hill for weeks and weeks and swim those laps till I was out of breath for months then I surely could do an Ironman! 4. At which point did you realize you could break your goal of 12h and where/ what did you draw your strength/ resolve/ focus from to dig deep and go for it. That was my most emotional moment of the race. When I left T2, I was 5 mins behind my schedule with my ‘weakest’ discipline to go. Somehow I thought I wouldn’t make it within my goal of 12 hours. What I didn’t realize is that the clock showed the professional’s race time. They started 15min earlier than us and I actually 10 mins ahead of my race plan! When I started my second loop and I realized I was much faster than I had anticipated all emotions broke loose. And this somehow gave me the kick to keep running at my pace when about midway I felt my legs becoming heavier. A big help came also from the most powerful legalized doping drink: coke!!! Amazing how it can push you! My coach and I had first a thorough discussion on my life style. Each aspect was taken into account and based on those inputs he prepared a training schedule that perfectly fit my needs. Being single obviously helps a lot in my training as I can be more flexible on my training hours, but then, my job requires me to travel quite often which makes it a challenge to fulfill all exercises. I have learnt, though, that it CAN be done. Every single day a little session will bring you through an Ironman! In the 180 days that I have been with Ironguides, I have only missed 17 days of training- despite Christmas (on my bike!) and New Year (long run!). No doubt about the first one which is also rightly highlighted by Ironguides: Consistency is key! Do a little bit every day and you will be ready at the start of your Ironman! The second lesson that I learnt is the incredible power of the human spirit to overcome adversity. For example – the number of times I wanted to skip training with teasers from my friends to join them for drinks or movies. Or when I had the panic attack, at the swim start and I almost withdrew from the race or when I almost got off the bike as my legs burnt so badly uphill against the wind. With Shem I picked a winning lottery ticket. We had an ongoing communication both with mails and face-to-face discussions. When going into your first Ironman there are many doubts, many anxieties, when starting for such a monumental endeavor there are various questions on the training and its effects, on how to pace yourself and what to take in as nutrition. Communication and understanding from your coach is the second most important thing after…his training schedule! 8. What life lessons have you learnt on this journey to Ironman? I learnt that with discipline and putting in the correct effort, I can achieve anything. I might not be the fastest and quickest, but I’ll be there at the end line, no matter what challenge I face. 9. What are the benefits of having a coach? What are the characteristics for a good coach to look out for? A coach brings in all the essential missing parts an athlete needs: experience, motivation, control. A good coach should explain how he works, what the benefit is behind each training session. He/ She should also be receptive to the athlete’s needs and be open to adapt to it when necessary. He or She should also be able to push the athlete to get over his “comfort zone” both physically and mentally. It is also important that a coach check in on the athlete, to regularly access their level of motivation and fatigue. Indeed, there are just 2 options when you choose to work with a coach: either you trust him completely or you don’t. 10. Think you can go faster? At 1.93m and 88kg I have all but a perfect triathlete “frame”. With such height/mass I suffer the heat more than a skinnier and smaller person hence IM races like Cebu and Langkawi I registered for will see me most likely go slower. Moreover, the swim leg in NZ was with a wetsuit which gained me at least 10min. On the other hand, I have gained experience, especially on the run part, and I will keep on training consistently. I am thoroughly confident that in a race that suits me in terms of temperature and route I will get in under 11 hours. Who knows, I might even take it down to 10:30! Roberto finished in 11:08′. This was an awesome result for his 1st attempt at the Ironman distance. The major improvement for Roberto came from the work that we did to improve his running gait and efficiency. While others may have questioned the rationale behind doing 15 x 100m running sprints for 12 weeks building up to an Ironman, Roberto didn’t bat an eyelid. He simply got his head down and did the work and came out a much improved runner after that block. His admirable work ethic and his ability to stay open and receptive to The Method were the perfect combination to achieving this goal!